The “7 pack” is a list of the top 7 businesses that show up on Google’s local mapped search results. 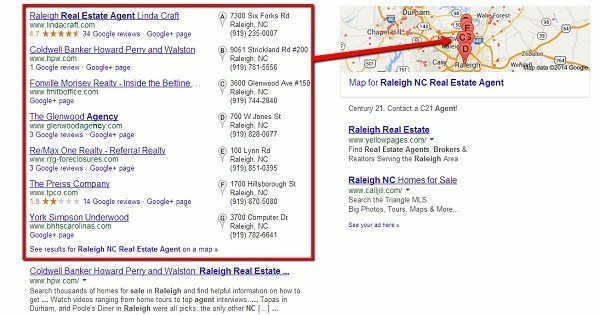 So, for instance, if you were to type the words “Raleigh NC Real Estate Agent,” Google will then show a map of seven real estate agents for Raleigh, NC on the right hand side of the page, along with their contact information and mapped office location. How Do I Increase My Chances Of Showing Up On Google Local? There are several things you can do to show up in the “7 Pack” for more exposure. For starters, you must list your business in Google Places and have a business page on Google Plus. In addition, you must have a common NAP, or Name, Address, Phone Number. It is very important to have a consistent “NAP” when it comes to listing the same company name and contact information. Yahoo Local Basic Listing – You can sign up for free. Foursquare – This is an excellent site to use since it is location based. If you’re wondering how to find these types of sites, just use Get Listed. This is a great tool to help you claim your business listings. With all of these tools at your disposal, be sure that your business is not already listed as you don’t want to duplicated business listings. Need More Information About Google’s Local Search Results? If you would like to learn more about what it takes to make the “7 Pack,” Google offers a great resource in this article. In the top right corner is the Google “Contact Us” button. We highly recommend you use that feature if you are having any issues with your Google Places account. We have used their support services in the past and the folks at Google were most helpful! Does your business appear in the seven pack? Thank you for your wisdom. Can I hire you to do this for me? You sure can. I’ll follow up via email.